2:21 PM When I started playing harmonica at my church, I was using a standard Shure microphone. Because I have a tendency to move my head while playing, I would inadvertently pull away from the mic, so people couldn’t hear me. So I held the end of the mic with the last two or three fingers on my right hand. But for a guy with CP, trying to do this while holding the harp was awkward. So I began looking online, to see what was out there. At first, all I could find were big, bulky things like the Green Bullet or the Superflux D112/C. But those require cupping both the harp and the mic in two hands. I knew I would not be able to do that. This microphone is specifically designed for harmonica players. It consists of an upper pod which has the volume control, and this is where the cord is attached. Then it has a center connecting piece that fits between your fingers. The lower pod is the microphone and is small enough to fit comfortably in your hand. And if you have larger hands, you can try the Mad Dog, which is just a larger unit. For me, this is a godsend, and might be the best harp mic ever. 6:51 PM You might want to consider The Harmonica Honker as an alternative. 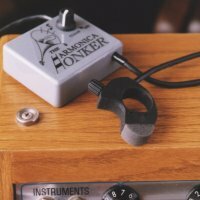 The Honker is a great little finger mic with a volume control and a distortion option that allows the player to select anything from sweet and clean to full-on dirty blues. This permanently out of production mic is extremely sought after. The maker passed away a couple of years ago and these high quality mics have been almost impossible to get your hands on since. Hand wah-wah effects, ease of use, belt clip, feather light weight...honkin tone...this mic is truly a masterpiece! Turn on the honk distortion and cup the mic in your hands and you immediately get the vintage Chicago tone that you'd normally only see from a bullet mic. I have had one for years, it's the only mic I ever owned.I know where you can get one, If you are interested. 7:28 PM There's always the option of getting a Shure sm57 and putting it on a stand so you don't have to hold it. It will run into a p.a. or with an impedance transformer will run in a tube amp. I got an original Shaker (pepper shaker type) mic last year and it sounds very good with my tube amp or I can put it through a p.a. Very light to hold too. Since we sit while playing I think I may have an easier time holding a mic. I have used a mic stand with a stick or ball mic many times and it's much easier to do hand effects that way. If the Madcat works for you go with it!